The Vascular Surgery Fellows Finishing School is a continuation of the Houston Methodist Course, which aims to provide a unique educational opportunity for vascular surgery graduating fellows and fifth year integrated vascular residents. 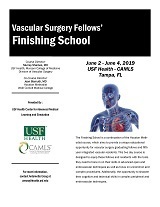 This two-day course is designed to equip these fellows and resident with the tools they need to hone in on their skills in advanced open and endovascular techniques as well as focus on uncommon and complex procedures. Additionally, the opportunity to sharpen their cognitive and technical skills in complex peripheral and endovascular techniques.